Yes, another day working when I should have been wargaming! I did, as usual, get into the club to eat my M+S butties and take a few pics of happy folk! The game I should have been playing -- WW1 Spearhead. ..Small numbers of Germans attacking across a river..
..in the face of hordes of French. ..with Cavalry!, a win for the French rather too likely I think! More French! - Napoleonic this time, battling Austrians. Rather smaller French, again Napoleonic -using Grande Armee. Everywhere you looked, there were French! Surely our die-hard ancient players would buck the trend? Ah - in one corner, a boardgame of Okinawa in WW2! The French haven't taken over the world completely! Sadly, this was the last club day until early September - Our regular August painting break! We will be back after Border Reiver, this year at Gateshead Stadium. 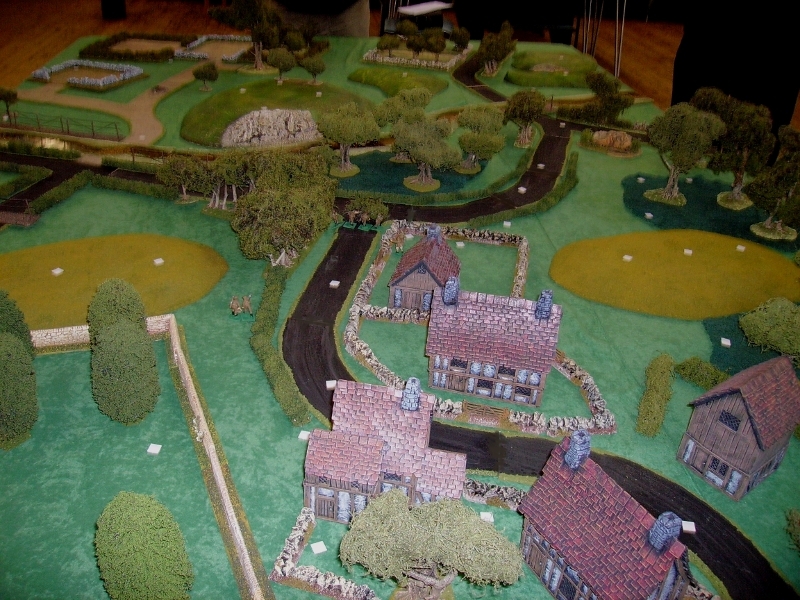 Today, we did a WW2 skirmish based on the premise that the Germans invade England in 1940, yep! - another 'Sealion' 'what if' game! We played individual Fallschirmjager (Paratroops) armed with just pistols (and the occasional MP40) - as they historically dropped, looking for comrades and weapon canisters to fulfil their mission, to take and hold a small village in Kent, and the road it commands. The battlefield--the markers can represent Germans, British, or supply cannisters. The village, guarded by Home Guard. The first group of Germans (Lawrence and Ian's) appear on the table edge. I was the commander, here joining Phil's men on te far side of the table to Ian and Lawrence. Phil sent his radioman forward to investigate an orchard. Ian and Lawrence's men separated to check their fields! Phil's radioman was spotted by a group of 6 Fallschirmjagers who, thinking he was British, opened fire with their pistols, thankfully missing him! Sheepishly - the group realised their mistake and joined our force. Lawrence's Feldwebel crept through the field and spotted 4 home guardsmen! Creeping back, unseen, he directed Ian's men to help. ..But seeing nothing, turned and moved off. Lawrence's Feldwebel crept forward again, but his grenade fell short! - fortunately, Ian's sniper suppressed the group. A second grenade from Lawrence, and sniper shot from Ian blasted the Brits before they could recover. After the Armoured car scare, Phils men found a heavy cannister. Ian's radioman crept forward and found another. My men found another group of Fallschirmjager! - things were looking good! Phil started unpacking 2 MG34s, a 5cm mortar, and an anti tank rifle from his container. ..just in time to greet 2 home guards on a cigarette break! My men had also been armed from Phil's cannister..
Cigarettes are bad for your health! Ian and Lawrence, having dispored of their enemies, probed forward. ..and saw a party of Home guard sitting round a tree. Being outnumbered, they wisely moved round the threat. My MG team found and retrieved a third cannister. Phil's men probed forward toward the village. Passing through the wood, they were fired on by 3 Fallschirmjager on a hill, who again mistook them for British!!! My guys, meantime, crept forward down the road toward the village. Phil's new allies were fired on by a Carrier - but their accurate pistol fire was more effective! - the crew abandoned their vehicle and ran! My Lieutnant sent a ifleman forward, but spotted by the roadblock guard he fell mortally wounded. Ian had dispatched his sniper onto the big hill overlooking the village - and with a combination of grenades and rifle fire forced them to flee. 2 more fallschirmjager appeared from off table near the village..and fired on the group of Home guards Lawrence had avoided. ..the Home guards, surprised, beat a hasty retreat! My men, armed with an MG34 and 5cm Grenatenwerfer, took out the roadblock guard. Phil and Lawrence, meeting no further resistance, moved round the village. The 2 Fallschirmjager on the road were ambushed by a Vickers team as they moved to join Ian's sniper. In the village however, the British were in full retreat. The Germans were entering the village from all directions. Even the arrival of 'The cavalry' could not affect matters! When we were clearing up, we found an A9 tank, and a squad of British regulars, as well as more units of Home guard, who we avoided! - we were lucky! -- such is war! Thrown to the Pigs again!